These ALL NEW BBK Cold Air Induction Kits are designed to work on the new 2011, 2012, 2013 and 2014 Ford Mustang 3.7L V6. They are a direct fit with no modifications or any tune required, this BBK cold air kit is optimized to work with the factory computer settings. 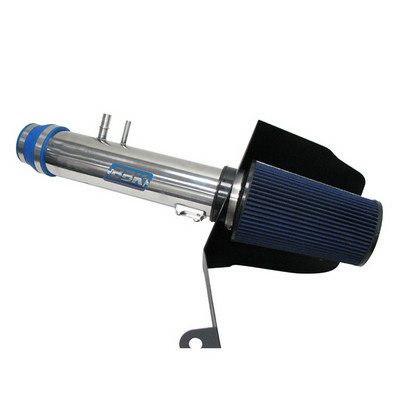 BBKs latest cold air intake kits for the popular 2011-14 Ford Mustang deliver great bang for the buck performance. BBKs latest cold air intake kits for the popular 2011, 2012, 2013 and 2014 Ford Mustang deliver great bang for the buck performance. Testing on dozens of stock 2011-14 Ford Mustang V6 models has shown consistent gains of horsepower with no other add-ons and the stock computer program. This high level of performance with the stock program is achieved by utilizing a custom integral mass air housing which is machined into our new aluminum casting and features a calibration of the factory mass air. While BBK engineers have seen some gains with a power programmer when used with a variety of modifications  they have not been able to achieve much more than what this cold air intake kit delivers. Each BBK Cold Air Intake model has been designed and dyno tested at the BBK headquarters in Southern California to maximize performance. 2011 2012 2013 2014 Mustang 3.7 V6 Roush Saleen & Steeda Vehicles. No one else can stack up to the bold clean styling of our aftermarket Billet dress ups, Street Strip & Racing Suspension & Performance Parts for your late model American Muscle Car!